Embarking on an I-5 road trip and looking for pit stops to please the kids? Stretching between Seattle and San Diego, Interstate-5 has no shortage of exciting cities, beautiful scenery, and road-side attractions to keep your crew entertained on family road trips. The question is, which are worth a stop and which are simply a waste of valuable travel time and travel cash? Making my home in an I-5 town, I’m well acquainted with this particular interstate, as are my kids. Below you’ll find our top five I-5 road trip pit stops that won’t break the bank or ruin your carefully planned schedule. Best of all, they’re all directly off an I-5 exit! This small-scale outdoor amusement park is a Northwest institution. Past the Enchanted Forest entrance, you’ll find winding paths amid lush scenery that instantly transport you to a fairytale world. Little ones will love Storybook Lane. Meanwhile, older kids could spend hours in the English Village and Indian Caves. My family loves the interactive and exploratory nature of these attractions. Plus, there are no long lines, which means no waiting! 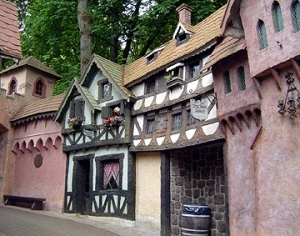 There are traditional rides as well, such as a log flume and mini roller coaster. Families can explore the entire park within a few hours. Admission is a reasonable price, with some attractions requiring an extra paid ticket to ride. Children under age 2 enter for free. If you’re not yet acquainted with Ashland, you’re about to fall in love. This small I-5 university town is home to the Oregon Shakespeare Festival and the fabulous Lithia Park. This park stretches over 93 acres just past the main downtown shopping district. Beautifully landscaped to create a true garden setting at any time of year, Lithia features several duck ponds, hiking trails, and an excellent playground. There are also green open areas, oak and aspen groves, and river bridges. If you stop by in winter, check out Centennial Ice Rink, Lithia’s outdoor skating pavilion on Wilburn right past the Plaza. Turtle Bay Exploration Park is a sprawling center of river walks, outdoor exhibits, indoor museums, and stunning views. This make it the perfect pit stop when everyone’s about to go crazy in the car. 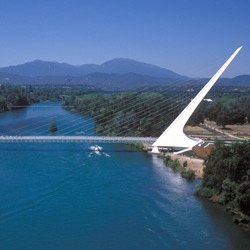 First up, run across the glass-bottomed Sundial Bridge. Then learn about local wildlife and forestation at Paul Bunyan’s Forest Camp. Finally, head indoors for multiple exhibits and displays. Everything at Turtle Bay is hands-on, and there’s a great onsite café. Before tackling the drive through California’s Central Valley, stop in Old Sacramento. As you exit I-5, you’ll suddenly find yourself in an Old West town. Expect false store fronts, one-room schoolhouses, saloons, and the best railroad museum we’ve ever seen. 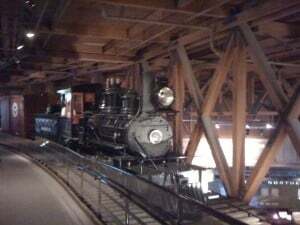 The California State Railroad Museum is well worth two to three hours of your time. Kids can walk through trains and learn about the history of the California railroad through life-sized displays. Families will also enjoy the museum’s IMAX film. If you’re traveling with young children itching for a chance to get out of the car and play, Pretend City is for you. 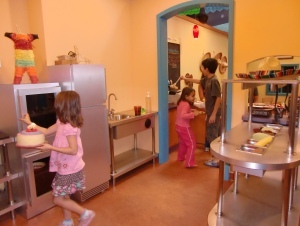 This huge indoor play space has been ingeniously laid out into a mock city for kids to explore. Kids “drive” on city streets with street lamps and pedal cars. They can visit the grocery store, where they can take turns as clerk or shopper. Then children can head to the post office, where they’ll be put to work sorting envelopes. Everything is designed to teach kids about how their communities run. At first glance, it seems Pretend City is geared for the under 8 set, but our older kids (aged 10 and 12 at the time) loved this attraction. In fact, they may have enjoyed handling pretend money, working make-believe jobs, and making pretend telephone calls even more than the preschoolers around them! Got any questions or suggestions about I-5 road trip pit stops? Let us know in the comments below! Amy Whitley is editor and administrator of Pit Stops for Kids, a family travel review site dedicated to finding the best resorts, attractions, restaurants, and experiences for traveling families. There are so many more things on the way that will cure that “are we there yet” syndrome. And when in San Diego- a tour of Anza Borrego Desert State part will delight kids from about age 5 up. Amy – Thank you for your I-5 pit stop picks! My kids LOVE Pretend City and the rest look like a lot of fun too! Those all sound like really great stops. I know when I am traveling with my kids I bring along my Ipad so they can watch their favorite shows. As a DISH Network employee I purchased a sling adapter and installed the easy and free application to my Ipad. I have access to my TV and recordings anywhere I am at. The kids love it! So in between those stops they have that to keep them entertained. We’ve driven I-5 lots of times since we moved from San Diego to Roseville 8 years ago. I can attest to the Old Sacramento Train Museum as a great stop! These are all great but there is a nice sized black hole from Sacramento to L.A. area. Absolutely nothing. No parks close to the road. Plus due to liability concerns, most fastfood places have no play structures anymore. On top of that two of the better rest stops traveling south have been closed for quite some time with no plans to open soon. We just pull into hotel parking lots to let the kids run around as there isn’t much else we can do. As most parents know a 2 year old won’t sit still for more than 2 hours with out starting to get cranky (if you are lucky). It’s pretty much 10-20 minute stops every 2 hours. Unfortunately, fewer good places to stop for a 2 year old to run around. Too much traffic around the fast food joints/sit-down places. LA to SF – Thanks for the heads-up on the black hole! I love that you still stop to let your kids run around regardless. Good idea! Hi Amy, My husband & I are planning a trip from San Diego to Seattle with our 3 year old son. We will be taking I-5 and stopping in Redding along the way. Is their any random pit stops that you would recommend? My hubby is leaving it up to me to figure it out since I ‘m the one wanting to drive. Please help us! Thank you. We have a whole page of listings on Portland: http://pitstopsforkids.com/category/city-and-town-series/city-series/portland-or/ and if you need another night’s stop, the Great Wolf Lodge in Centralia is between Portland and Seattle. Have a good trip! You should also take Exit 33, Central Point and visit Don Jones Memorial Park. It features the Oregon Fallen Hero’s War Memorial in addition to the Water Spray Park (open during Summer Hours and is free). 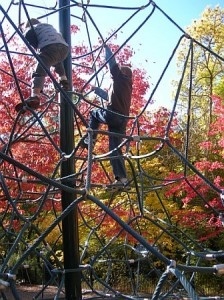 It has a large playground so grab your lunch and head to the park to stretch your legs! Sara – Thank you for the I-5 pit stop recommendation! Sound like a great place to stop during a family road trip. It’s a beautiful park with everything you would want. I wrote a yelp review with lots of details. Wish there were more like it between Orange County and Sacramento. Gina – Great tip! Thanks for sharing! Try Bravo Farms at Kettleman City. We drove from SF to SD earlier this year, on i-5, and wanted to find a fun place to stop for the kids to have an hour or two break. Our research on the internet yielded a big empty nothingness between Sacramento and LA. But most of the posts were at least a couple of years old. Luckily, we happened across a new stopping point at Kettleman city, called Bravo Farms, which seems to be pretty new. It was perfect for us. They’ve got shops selling all kinds of stuff you don’t need, kind of like what you find at those Delta Queen car-washes. But their barbecue is really good – my husband wanted to drive all the way back there just for the brisket. And a nice little outdoors seating area with wild west themed “buildings” for the kids to play in. It’s a great addition to the i-5 corridor! Deirdre – Thanks so much for sharing your tips! My husband and I just went to Brownsville, Or. Its just a few miles off the I 5 in central Oregon. We went to a museum iin old train cars. This is a Historic town and the museum was free. Just a donation. That’s not required. There are parks & other things as well. I haven’t read all the post’s, but as we travel south, our next stop is the ‘it’s that ice cream place’ in Rice Hill/Oakland. I believe it’s k&r ice cream. You can Google both of these for more iinfo. Kym – Thanks much for the suggestions! Enjoy your road trip, Katie! Forestierre Underground Gardens, in Fresno, is a nice stop. This underground house and garden is amazing for the time it was built. Even though it has been partially destroyed by the freeway it still is amazing considering that this person did it by hand and grew much of his food. Thank you for the I-5 pit stop tip, Tom! The Railroad Park Resort in Dunsmuir is a great place to spend the night. You can sleep in an old caboose and swim in the pool or the pond. Also, about an hour to the west of Grant’s Pass is the unforgettable Tresort–spend the night in the treehouse of your dreams. Also, I spend the night at a pull-off called Westley: the motels are right-priced, and then you’re a quick hour’s drive over the hill to San Francisco & all the great stuff to do with kids there! What wonderful tips, Helen! Thanks for sharing. My kids would love to spend the night in a treehouse!! !